Golden’s exclusive MaxiComforter series is now available in six sizes, including the all-new Tall and Extra Wide! 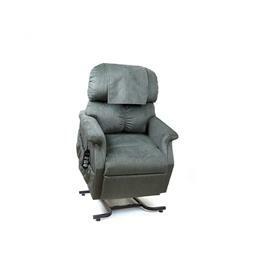 The MaxiComforters feature a plush, seamed backrest with lumbar support, a soft, comfortable seat and our unique "grip rite" arm design. Every MaxiComforter comes standard with our patented MaxiComfort Ultimate Recline Technology for possible spinal alignment, back pressure relief, and improved circulation. Available in 6 sizes: Junior Petite (PR505JP), Small (PR505S), Medium (PR505M), Large (PR505L), Tall (PR505T), and 500 lbs (PR505-M26).